DHAKA, Apr 8 2015 (IPS) - Judging by how often they make headlines, one might be tempted to believe that women in Bangladesh don’t play a major role in this country’s affairs. Fewer than eight percent of all the stories had women as the central focus. Of the few women who actually made an appearance on the TV screen, 97 percent were reading out the news, while just three percent fell into the category of ‘reporters’. Only 0.03 percent of all bylined stories studied during that period carried a woman’s name. While these statistics might seem daunting, women across the country who are not content to sit by and wait for the situation to change have taken matters into their own hands. They are doing so by getting on the airwaves and using the radio as a tool to raise the voices of women and bring rural issues into the limelight. Women comprise 49 percent of Bangladesh’s population. Like the vast majority of people here they are concentrated in rural areas, where 111.2 million people – or 72 percent of the population – live. Their distance from policy-making urban centres casts a double cloak of invisibility over women: according to data gleaned from the BNPS study, a mere 12 percent of newspaper articles, seven percent of TV news items and just five percent of radio stories focused on rural or remote areas – even though urban areas cover just eight percent of this vast country’s landmass, and host just 28 percent of the population. The absence of women and women’s issues in the media is a dangerous trend in a country that ranked 142nd out of 187 states in the United Nations Development Programme (UNDP)’s most recent Gender Inequality Index (GII), making Bangladesh one of the worst performers in the Asia-Pacific region. Yet, even this is not mentioned in the news: the BNPS study showed that less than one percent of over 3,000 news items surveyed made any mention of gender inequality, while only 11 news stories challenged prevailing gender stereotypes. Given that Bangladesh has an extremely low literacy rate of 59 percent compared to the global average of 84.3 percent, according to the United Nations Educational, Scientific and Cultural Organisation (UNESCO), the importance of radio cannot be underestimated. Even in a nation where 24 percent of the population lives below the poverty line, radio is a widespread, relatively affordable means of plugging into the world, and is extremely popular among the millions of rural families that comprise the bulk of this country. Momena Ferdousi, a 24-year-old student hailing from Bangladesh’s northwestern Chapai Nawabganj District, is one of the country’s up-and-coming radio professionals. She is the senior programme producer for Radio Mahananda, a community radio station launched in 2011 that caters primarily to the thousands of farming families in this agricultural region that comprises part of the 7,780-square-km Barind Tract. 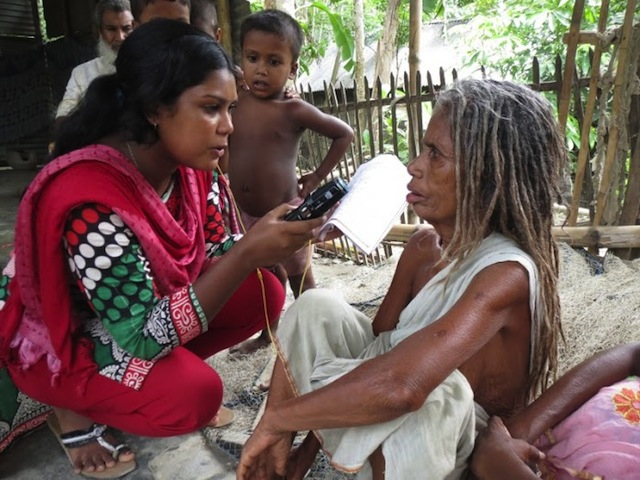 She tells IPS she would not be where she is today without the support and training she, and scores of other aspiring female radio workers, received from the Bangladesh NGOs Network for Radio and Communication (BNNRC). Fellowships and capacity-building initiatives sponsored by BNNRC have resulted in a flood of women filling the posts of producers, anchors, newscasters, reporters and station managers in 14 regional community radio stations around the country. Miles away, the confident voice of Sharmin Sultana on Radio Pollikontho, broadcast in the northeastern district of Moulvibazar, reaches roughly 400,000 people spread over a 17-km radius. With five hours of daily programming that focus largely on issues relevant to rural women, Radio Pollikontho has filled a huge gap in this community. The difficulties facing women here in Bangladesh are legion. Only 16.8 million women are employed in the formal sector, with the vast majority of them performing unpaid domestic labour on top of their duties in the farm or field. A lack of financial independence makes them extremely vulnerable to domestic violence: a recent study by the deputy director of the Bangladesh Bureau of Statistics (BBS) found that 87 percent of currently married women have experienced physical violence at the hands of their husbands, while 98 percent say they have been sexually ‘violated’ by their spouses at some point during marriage. The survey also revealed that one-third of all married women faced ‘economic abuse’ – the forcible withholding of a partner’s financial assets for the purpose of maintaining financial dependence on the perpetrator of violence. In 2011, 330 women were killed in dowry-related violence. 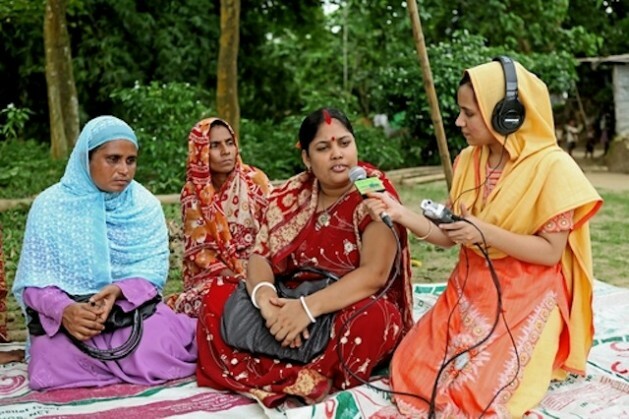 Other issues, like child marriage, also make pressing news bulletins for community radio stations directed at women: according to United Nations data, some 66 percent of Bangladeshi girls are married before their 18th birthday. The situation is bleak, but experts say that as women become educated and aware of their rights, the tide will inevitable turn for the better. It remains to be seen whether or not more women’s voices on the air will uplift the half of Bangladesh’s population in need of empowerment. But every time a woman’s voice crackles to life on a radio show, it means one more woman out there is hearing her story, learning her rights and moving closer to equality.